“Teen Suicide Is Soaring.” “More Kids Are Attempting or Thinking About Suicide.” These are a couple of the chilling headlines that appeared in newspapers and magazines in recent months. Anxiety disorders have been steadily increasing in adolescents since 2012 and depression among teens is also on the rise. Suicide is now the second leading cause of death among teenagers 15 to 19 years old. Disturbingly, 80 percent of kids with a diagnosable anxiety disorder and 60 percent of kids with diagnosable depression are not getting treatment, a 2015 Child Mind Institute Children’s Mental Health Report revealed. The data is unsettling; however, the upside is an increasing public awareness. Anxiety disorders and depression are treatable, especially if caught early. The American Academy of Pediatrics (AAP) issued new guidelines in February 2018 that call for universal screening for depression in teens starting at age 12. The screening is a simple two question process that asks whether or not the patient has experienced decreased interest or pleasure in doing things, and whether or not they’ve felt excessively down or hopeless. These questions act as a first-step approach to earlier detection and a catalyst to dig a little deeper if need be. If anxiety goes untreated, it can often lead to depression, says Natalie Vona, licensed psychologist with 5280 Pediatrics. Nearly everyone will experience some anxiety in their lives, but when it becomes urgent and consistent, it should be treated. Review the symptoms of anxiety and depression in the accompanying list. The trouble is that some symptoms look a lot like normal teenage behavior. The Centers for Disease Control explains that normal developmental changes during the early teen years (12-14 years old) include things such as vacillating between high expectations and a lack of confidence, increased moodiness, and feelings of sadness. Anxiety and depression manifest similarly. Vona says many people are often unsure if what they are feeling and thinking is “normal” or if it is something more serious. Because of this, teen depression or anxiety might be dismissed “as being a teen” or not noticed until something more serious — like self-harm or a suicide attempt — happens. The bottom line is that if you notice a pervasive, persistent pattern of some of these symptoms, talk to your child’s pediatrician or make an appointment with a mental health professional to address concerns. In a nutshell, a lack of sleep, overwhelmingly busy schedules and hyper-connectivity are likely contributing to this rise in anxiety disorders and depression. Morley points out that causality is always difficult to prove, but this trifecta is certainly not a benign one. 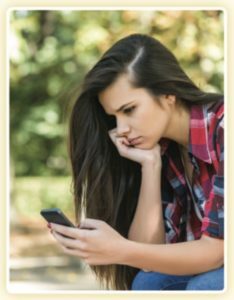 Morley and Cooper also point out that although teens are hyper-connected, they are missing out on human connections and real emotional bonds. This leaves them feeling isolated — a precarious state for anyone. In addition to detracting from human connection, screens on devices also stimulate the part of the brain that controls sleep cycles, causing greater sleep loss. Experts agree that one of the most important things you can do to help your teenager is to be present and to talk with him or her on a continual basis. Spend enough time with them that you will notice when things are off. As conversations like this unfold, teens may also become more aware of changes within themselves and make them more tuned in to friends who might need help as well. Talking with your children about mental health is just as critical a conversation as talking with them about sexuality and substance use. And, likewise, should be just as ongoing. major changes in sleep or eating patterns.